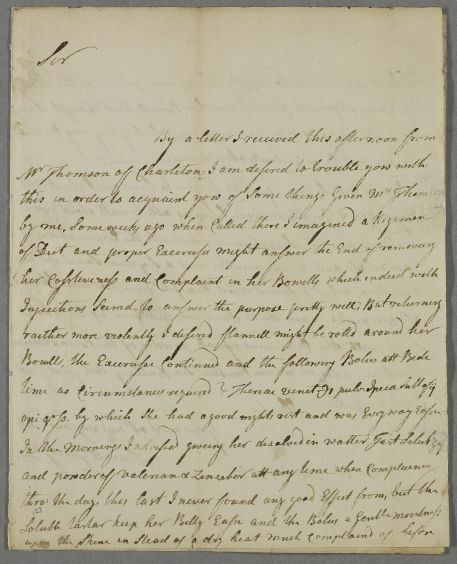 Letter from David Goodsir regarding treating Mrs Thomson of Charleton's bowel complaints with flannel wrappings, plasters and other medicines. He also updates Cullen on their old patient, Mr Henderson, who is 'Greatly recoverd, being no[w] able to walk about upon his limbs, and the Sensation very distinct, the Evacuations of Excriments and urine regular'. 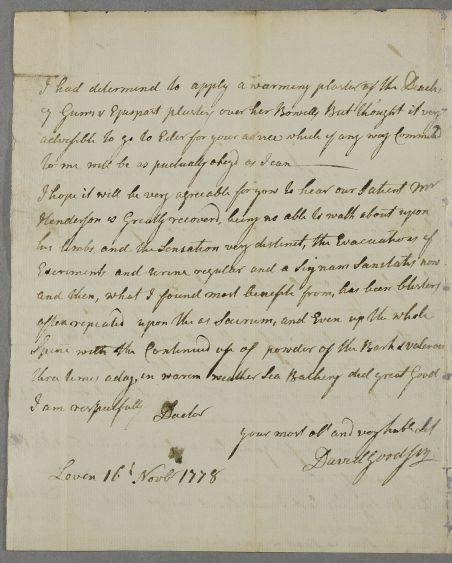 Summary Letter from David Goodsir regarding treating Mrs Thomson of Charleton's bowel complaints with flannel wrappings, plasters and other medicines. 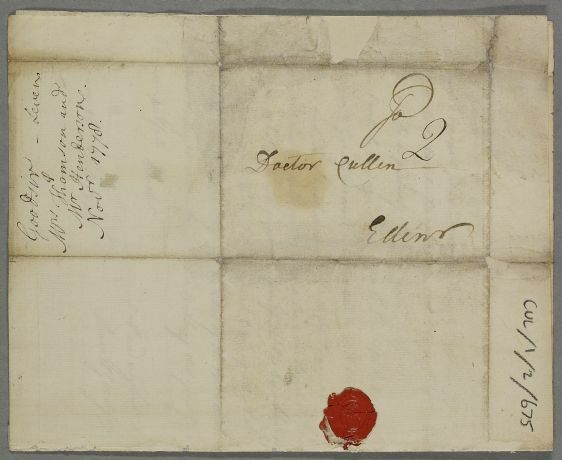 He also updates Cullen on their old patient, Mr Henderson, who is 'Greatly recoverd, being no[w] able to walk about upon his limbs, and the Sensation very distinct, the Evacuations of Excriments and urine regular'. Case of William Henderson who is seriously ill with severe weakness, sweatings, a disordered bowel and 'insensitivity' in his 'left limb'. opi grſs. 1 by which she had a good nights rest and was Evry way Easier. 1: "Take a scruple of Venetian Theriac, 2 grains of finely powdered Ipecacuanha, and half a grain of Opium". 2: "2 drachms of Soluble Tartar".